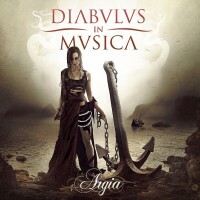 2012 was the year I got to know about the Spanish Gothic Metal band DIABULUS IN MUSICA, as they released their second full-length then, called “The Wanderer”. And it was a positive experience, I must say. See my review here. Since then the band played of course the necessary gigs, but also saw their line-up reduced to two people: Zuberoa Aznárez (vocals) and Gorka Elso (keyboards, growls). To be replaced: bass, guitar, and drums. Several months later, in 2013, the line-up was completed with three new members. And so the band could continue to play gigs and more importantly, work on a new album. “Argia” was again mixed and mastered by Jacob Hansen, like the band’s previous album, “The Wanderer”. And like before, the band got some help from guest musicians for vocals (a.o. Thomas Vikström – known from CANDLEMASS, THERION, etc. ), choir, and instrumental recordings (a.o. Ad Sluijter on guitar, ex-EPICA). The album itself was released in April 2014. It all begins with the cinematic intro of “Et Resurrexit (Libera Me)” in an Eastern atmosphere. The music, while symphonic, is adapted to that setting, as well as given a Folk touch. And so the whole grows, becomes more bombastic, with the choir leading it all into “From The Embers”. Here it’s mainly about Metal, the Thrashy kind. Guitars produce a ferocious and aggressive sound, while drums push everything onwards. Choirs add to the bombast. Vocal duties are divided between Zuberoa and Gorka (grunts), while the choir and orchestral instrumentation occupy the bridge, linking very well with the rather Poppy (melodic, yet heavy) and catchy chorus. A dark and vile bridge allows for another Metal assault before the themes of before return and the song draws to its end. Massive start of “Argia”, the intro excluded (or included, as it leads into this song). With “Inner Force” DIABULUS IN MUSICA copied a little of AMARANTHE’s repertoire, as the beginning (rhythm guitars, synths) reminds a lot of e.g. “Hunger”. But to cover it up the band added choirs and bombast. Nevertheless, I’m no fan of AMARANTHE and when I listen to DIABULUS IN MUSICA, I don’t mind other influences, but this is too apparent. Verse-wise the music and vocals flow in a theatrical manner, guided by bursting Metal. All this leads directly into a powerful and melodic chorus, which is again very accessible, despite the heaviness of the guitars. The choir comes to the front around halfway, followed by thundering Metal. Afterwards, all back to normal. Despite the aforementioned copy-pasting, this is another very good song. Which doesn’t mean I suddenly like AMARANTHE. “Furia De Libertad” also has a cinematic intro to begin with. Thundering Metal is added in a next instant, while the orchestral arrangements carry on. The verses have an Eastern/Oriental influence, are atmospheric. There’s the heaviness of Metal, but it plays a secondary role, more to fill holes. Full power and volume comes to life in the bridge and so into the fast(er), bombastic chorus. Very nice here is the male choir that gets a short moment of glory, as the female side is usually the dominant side on the album. And the females do come in a little later. But still, it sounds quite awesome! More oriental influences can be heard in “Maitagarri”, where the music is also more Folky. The verses are acoustic (and Folky) at first, in a next instant guitars and drums are added, but the flow remains intact. Bombast and operatic singing is reserved for the chorus. Massive musical talk takes over afterwards, twice even. In the second part it’s the orchestral input that dominates. As acoustic music was key in the beginning, so it is at the end. “Sed Diabolus” is an interlude, delivered by keyboards, acoustic guitar, atmospheric backings, and chanting. Not bad, but not that exciting either. Or perhaps one should see it in connection with “Spoilt Vampire”, with its dark and threatening, oppressive Metal bursting loose and demanding full attention, even if vocals and keyboards try to push through the barrier. The organ guides the growls in the chorus, and this also shows the contrast, the beauty-and-the-beast aspect that is typical in this genre. Halfway the track there’s an orchestral break, leading to happier sounding music with Zuberoa again leading on vocals. However, the dark growls and guiding organ sounds are not far off. To make it all more lively, or add to the aural spectacle, the choir rounds it off. One track that is very welcome at this stage: “Eternal Breeze”. It’s a ballad. Talk about a moment of rest! But that rest doesn’t last long, as the ferocious and bombastic Metal of “Mechanical Ethos” wildly disturbs the aforementioned peace. Even more so with the addition of synths to increase the energetic aspect of the music. Heavy music contrasts with the fragile voice of Zuberoa in the verses, while full power (music and choirs) unleash their potential in the chorus. Another highlight on the band’s newest output. “Encounter At Chronos’ Maze” begins in a cinematic fashion, followed by Doom Metal-like continuation and orchestrations in the back. When all falls silent, the spotlights are on the two vocalists: Zuberoa and Thomas Vikström, while the orchestra takes care of the musical aspect. Guitars and drums do come in to add a bit of power to this theatrical, lively song. Bombast and choir are activated in the chorus. A dark bridge halfway flips the coin in favour of heavier and darker tunes, as well as growls. While the orchestral music was dominant in the first half, it’s all or mainly about Metal in the middle, while the third part is similar to the first. “Indigo” is an other ballad. It starts with acoustically, in an atmospheric, cinematic manner. This is another very nice track that transports you to the colourful world of fantasy. Buckle up then for the assault and devastation that is to be unleashed in “Healing”: uptempo Thrashy Metal! But then all changes radically as the choir comes in and the music adapts itself to that. The verses are again heavy, firm and powerful and allow for some headbanging. But this last thing proves to be quite dangerous to the brains, as was written recently in the press. See one example here. The tempo drops a bit in the slower, NIGHTWISH-like bridge. The chorus is, again, of the catchy kind. The shift back to the Thrashy part… flawless! An orchestral/operatic bridge splits the song in two. Afterwards the power of Metal takes over again. Last but not least, there’s the instrumental “Horizons”. Nothing Metal here, just atmospheric, oriental-influenced music. “The Wanderer” was a very good release, showing that DIABULUS IN MUSICA has very much potential. With “Argia” the band took it further and the result is definitely worth hearing. The orchestral bombast, the fury and aggression of the guitars and drums… almost eargasmic. Round it off with the vocals and you’re set for a very wild, engaging, challenging musical adventure. So if you’re into EPICA, AFTER FOREVER, XANDRIA, and so on, or orchestral Metal in general, do give “Argia” a chance and several spins. Definitely one of the best releases this year!